Despite the Americans with Disabilities Act (1992), we are still seeing discrimination in the area of parental rights due to disabilities. Parents with disabilities find their rights taken away on account of their disability, while parents of children with disabilities find their rights questioned. 35 states include disability as grounds for termination of parental rights; 2/3 of dependency statutes allow the court to determine that a parent is unfit on the basis of a disability; and D.C. and 9 states (GA, KS, MD, MS, ND, NM, OH, OK, & SC) allow physical disability as the sole grounds for terminating parental rights, even without evidence of abuse or neglect . Further, the shameful eugenics-era Buck v. Bell decision remains the precedent for removing family privacy rights, including parental rights, from persons with disabilities. Parenting with Multiple Sclerosis - This article on parenting with MS gives us a glimpse into how challenging parenting with a disability can be. Parents with disabilities deserve our support; yet sadly, they often receive criticism or even find their parental rights questioned or taken away. Have a Low IQ? The Government Can Take Your Child - Imagine losing your child because state officials don't think you have a high enough IQ. This article reports that happening to one Oregon couple. The couple was finally reunited with one of their sons in December 2017, but, as of early 2018, the other remains in state care. For Parents Around the Country, Having a Disability Can Mean Losing Custody of Their Kids - This article shares the sad bias that often results in parents with a disability losing their children, along with some legislative action that's in progress to help. Research indicates that parents with disabilities and their families are overrepresented in the child welfare system. While parents with disabilities make up only 6.2 percent of all parents in the United States, a recent study found that 19 percent of children in foster care have a parent with a disability. The Insulting Childbirth Experiences Mothers With Disabilities Endure - Experiences like those expressed in this article are why the Parental Rights Foundation supports the adoption of policies or laws to specifically protect parents with disabilities. Sometimes, their disability is the sole reason for their children being taken from them. What is worse is that they are less likely to get their children back once the state takes them. All of this violates the Americans with Disabilities Act (ADA). 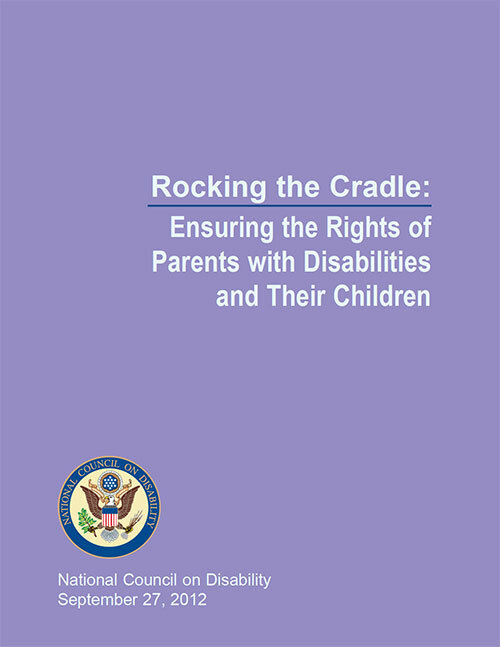 The National Council on Disability’s 2012 Report, Rocking the Cradle, points out a number of issues of discrimination that parents with disabilities or parents of children with disabilities must face far too often. The rate at which their decisions are second-guessed and their parental rights threatened is unconscionable. You may not have time to read the full 445-page report, but the Executive Summary (starting at page 13) gets to the heart of the issue in only a few pages. Removal rates where parents have a psychiatric disability have been found to be as high as 70 percent to 80 percent; where the parent has an intellectual disability, 40 percent to 80 percent. In families where the parental disability is physical, 13 percent have reported discriminatory treatment in custody cases. Parents who are deaf or blind report extremely high rates of child removal and loss of parental rights. Parents with disabilities are more likely to lose custody of their children after divorce, have more difficulty in accessing reproductive health care, and face significant barriers to adopting children. Christopher & Dana Reeve Foundation, Parenting with a Disability: Know Your Rights Toolkit (Short Hills, NJ: Christopher & Dana Reeve Foundation, 2016), 4–5. This stat has been marginally (but fortunately) reduced by new state laws passed in the last 6 months. This information was brought to you through the partnership of people like you. Partner with Us to Protect Parental Rights. Judge Orders CPS Return 7-Y-O Taken From Parents for Refusing School's Demands for Mental Diagnosis - The "Maples wrote that the court ruled that the allegations against them were 'unsubstantiated,'" yet they still faced a custody battle, even though their son was returned home.